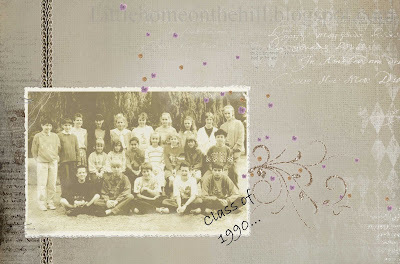 My old primary school class is planning a reunion. The idea started on the social network site Facebook where some of us got back in touch. Uncovering all these profiles is fun for curious people like me but now it's time to meet again, in person, to hear what everybody's been up to and what they are doing with their lives. Did the one who loved to cook make it into chef or the one who loved gardening, did he become a landscape designer? Who became the devoted housewife with a bunch of kids, who is the adventurer travelling all over the world, exploring unknown places and who is the businessman completing MBA programmes, writing notes on his blackberry? Inspiration from Vinnie Pearce. Check out her beautiful scrapkits!